Thursday 5th September saw us make an early start – on the road at 8 a.m. from Montluçon to Orcines. Beautiful scenery in the Auvergne as we left Allier and entered Puy-de-Dome. Morning coffee at Pionsat (near Chez Suzanne), lunch at St-Gervais-d’Auvergne, nice hotel under the Puy-de-Dome and overlooking Clermont-Ferrand – the Hotel Relais des Puys. Straightaway on arrival at the hotel, Mark Waters (formerly Touring Officer with the CTC) suggested that he and I tackle the Col de Chayssat, the highest point you can legally ride a bicycle to the summit of Puy-de-Dome. Job done at 1,078 metres! Friday was a bit of a rest day for both the riders and the van-man. Beautiful scenery and beautiful weather. Coffee at St Saturnin – where I spotted a bike shop in a house basement, completely unsigned – lunch in the market square of Champeix and an early arrival at the Hotel Paribou in Issoire. This meant that I could go pedalling – a lovely 40-mile ride up through the forests to St-Catherine-de-Fraisse and a fast sweeping downhill return on the main road. Excellent! Saturday saw the riders take a hilly, lengthy and very wet ride from Issoire. The rain started well before St-Catherine but I managed to pursuade the village restauranteur to offer the riders hot drinks! 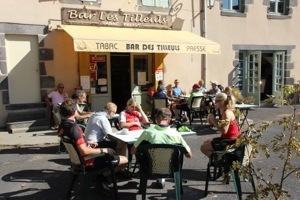 The rain cleared for lunch at St-Alyre-d’Arlanc but came back with a vengeance between there and La-Chaisse-Dieu and it reached Old Testament proportions on the road to St-Paulien! This would be my rest-day from my usual evening ride! Sunday was less wet! 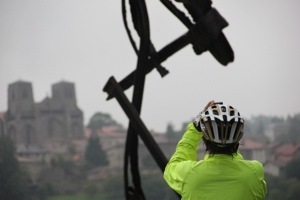 A quick descent from St-Paulien to Le-Puy-en-Velay for elevenses; a steady ascent to Le Monastier for lunch; a climb over the boundary between Haut-Loire (Auvergne) and Ardèche (Rhone-Alpes) to Le Beage and the day finished at St-Cirgues-en-Montagne. My evening ride was up to the Atlantic/Mediterranean watershed!